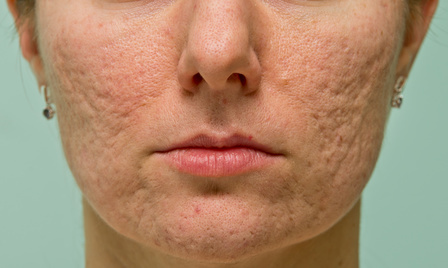 Acne scars and other skin scars can be disfiguring and are often a source of stress for individuals. Scars disrupt the natural beauty of skin. The skin of an individual may be perfectly healthy, but scarring gives the impression of unhealthy skin and that a skin problem or skin condition still exists. In fact, in many cases the source of the problem that caused the skin to scar has long gone and only the scars remain on what is otherwise healthy skin. Share your best acne cure or treatment or your acne story with other readers. Please visit acne skin care. Scarring on the skin can be caused by a variety of different sources. For example, a skin problem such as acne can lead to acne scars on the face and acne scars on the body. This type of scarring is likely to be evident in individuals who have had chronic or very bad acne in their younger years and the acne was not properly treated or left untreated for a long period of time. Skin scarring may also be caused by trauma to the skin. Common types of skin damage caused by trauma are cuts, punctures, scrapes and abrasions, and second to third degree burns whether caused by chemicals or heat. A third source of scarring on the skin is not accidental as the trauma examples above, but for the most part intentional. This third source is surgical procedures. Depending on the type of surgery that is required, these scars can be quite large and thick or very thin and small. Nowadays, with arthroscopic techniques many surgeries can be performed with minimal skin scarring. Unfortunately, this technique was not available several years ago and individuals who had even minor surgery in the past are left with a large scar as a reminder. Modern day surgeons, for the most part, tend to make their cuts as small as possible and as thin as possible and still perform successful surgery. Modern day surgeons are more sensitive to skin scarring and the psychological effects caused by the presence of a skin scar. A keloid can be described as a special type of scar that affects the skin. This type of scar is irregular in shape and has a smooth top. It can be pink or purple in color. Unlike acne scars or other typical scars than can occur on the skin, keliod scars tend to enlarge over time. Because skin scars are problematic for many individuals, removing scars or fading scars to make them less noticeable are very important subject areas. There are various treatments that can be used to eliminate scars from acne or other types of skin scarring. The use of lasers is one technique. Chemical peels and microdermabrasion and dermabrasion are others. There are also home remedies that have been suggested. Certain products have been developed that are specially formulated for scars. Mederma is one such product and it is the number one doctor and pharmacist recommended product for skin scars. Historically, the use of vitamin e has been used on scars. Finally, it is not always possible to prevent scars from appearing on the skin. However, steps can be taken to ensure minimal scarring occurs. Verseo is another company with a specially formulated scar removal product. A quality scar removal product such as the Verseo scar removal cream can help erase scars and blemishes that ruin the skin’s appearance and natural beauty. If your skin has scars from surgical procedures, scars from cuts or abrasions or other injuries, acne scars, or any other type of related skin blemish, the Verseo Scar Gone product can help. This product for scar removal is simple to use and very effective. The special patented blend of fine ingredients in this scar fading product absorb rapidly into the skin once the product is applied so that it can function at the cellular level. It not only promotes new and healthy skin growth but also protects the skin. Verseo ScarGone is a patented blend of ingredients that are engineered to absorb quickly into the skin while protecting and promoting new skin growth. These two factors lead to effective scar fading.